Walthamstow Stadium took a sensational twist yesterday that could throw the whole application out with legal challenges to the council now set to follow. The Chief Whip has been accused of fixing planning applications in the Borough by the Chair of the planning committee, Councillor Barnett. Councillor Barnett accepts that the matter must be fully investigated and that the matter calls in to question the decision of the committee to approve planning permission to London & Quadrant. It is alleged that pressure was put on fellow Councillor Ebony Vincent who voted in favour of the L&Q application in the 4:3 decision. Saveourstow and Stow Residents Association claimed that the decision was predetermined in their opening speech at the planning meeting. A councillor told the association that a “political” decision had already been made before the committee sat. We welcome the ‘whistle blowing’ and urge the council to offer no resistance to the judicial review. 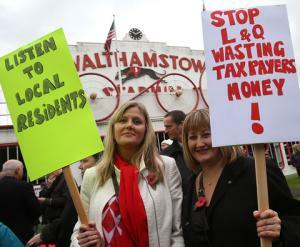 If the council is to retain any shred of credibility whatsoever, there must not only be an investigation in to the whole matter including the Walthamstow Stadium application but this investigation must be fully independent and not internal. Work and pensions secretary Iain Duncan Smith in his capacity as MP for Chingford and Woodford Green will on Tuesday meet his cabinet colleague Eric Pickles, the communities and local government (CLG) secretary, for urgent discussions about the fate of the famous Walthamstow greyhound racing stadium amid claims that Boris Johnson has misled Londoners about the viability of a controversial scheme to redevelop the site, and that officials in Pickles’s department colluded with the London Borough of Waltham Forest to prevent Pickles using his powers to intervene. Duncan Smith will be accompanied to Tuesday’s meeting by the area’s other local MP, Labour’s Stella Creasy, to make a joint request that Pickles examines a trail of alleged irregularities in the progress of the plans and looks at its full financial history. To read Dave Hill’s full blog in the The Guardian, click here. Iain Duncan Smith will be making a very important announcement at tomorrow’s demonstration outside Walthamstow Stadium at 1pm. The fight is not over and so we are asking everyone to show their support tomorrow. Please Facebook this post to all your family and friends, we need everyone to attend!